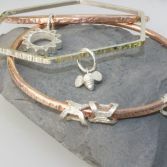 Our Textured Bangle With Bee has been designed handcrafted and finished by me. It has a unique textured hammered surface which adds real interest and is a hexagon shape. 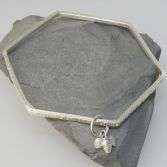 This unique bangle is made from 2.0 mm thick solid sterling silver square wire which give it a contemporary look. Attached to the Hexagon Bangle is a our little Bee charm exclusive to JBJ which moves freely around the bangle. It comes in various size's small, medium and large and is available in either a bright silver finish or a blue black oxidised finish (price is for one bangle) Create your own look by stacking different bangles together! 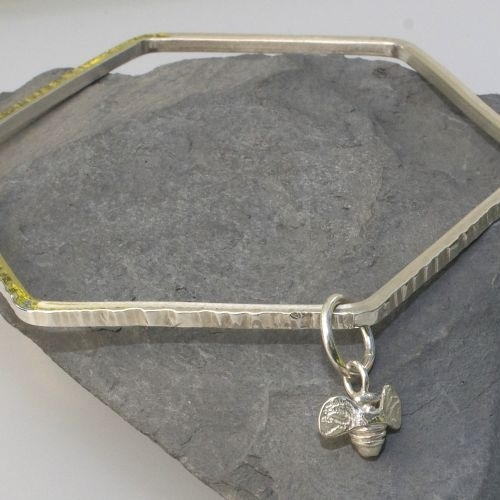 Your Hexagon Bangle with Bee has been fully hallmarked at the Edinburgh Assay Office and all my sterling silver is sourced from a reputable UK bullion dealer. Whether buying the Hexagon Bangle with Bee for yourself or as a present your bangle will be presented in one of signature gift boxes and posted via Royal Mail special delivery (signed for) free of charge to any UK address. Due to the handmade nature of the Textured surface very slight difference may be present in the textured pattern as hammered by hand. 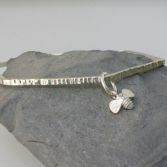 However the pictures are a good representation of the Bangle you will receive.